Forget about spending your savings on bulky consoles and gaming rigs, it turns out you can play games straight from your calculator – including classic titles like Grand Theft Auto (GTA), Doom and Skyrim. 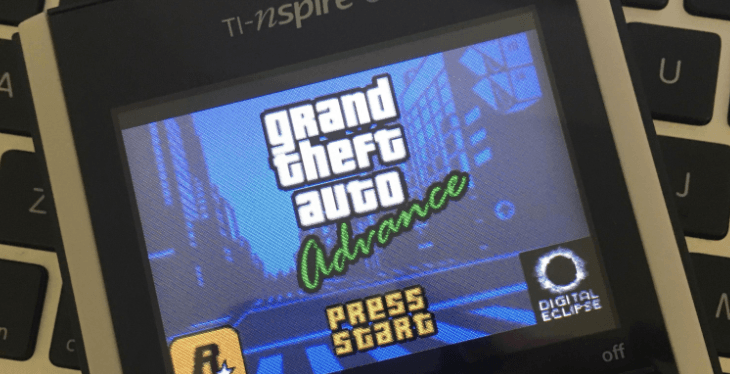 Toying around with his TI-Nspire CX graphing device, Redditor RogueConditional has managed to run GTA Advance (the 2004 version of the game for Nintendo’s Game Boy Advance) on the calculator entirely natively. But while this might seem impressive, it’s nothing new to avid TI-Nspire enthusiasts. In fact, numerous crafty tinkerers have been running games on the popular graphing calculator for years now. As RogueConditional points out, the TI-Nspire series runs on ARM architecture (the same technology that powers electronics like smartphones and tablets) which practically means you can tweak it to load standard ARM software. And this is precisely what the Redditor did. Utilizing Ndless‘ jailbreaking software for the TI-Nspire series, RogueConditional was able to install a Game Boy Advance emulator and load the game on the calculator. In fact, should you have a calculator from the TI-Nspire line, you can follow these instructions to do the same. So next time you feel bored in math class, now you know how to enjoy some gaming without being obnoxiously conspicuous. We’ve asked RogueConditional for GTA gameplay footage and will update this piece if he sends one our way. Update: Here’s a little boot-up footage from RogueConditional.